How long does it take to travel by horse? While working on my Lucy Campion historical mysteries, I came across a rather straightforward mystery of my own: How long would it have taken to travel the 50-plus mile trek from London to Oxford, by horse and carriage, in the mid 17th century? This is the kind of question that can baffle me as a writer of historical mysteries. I want to be reasonably accurate when I write, but questions which focus on things we no longer do (“How did this work?” “How long did this take?” “How hard was this to do?”) or which we don’t have access to today (“What did this sound like?” What did this smell like?”) can be particularly difficult to research. I have some faint memory of an equation that claimed distance=rate x speed (and even worse memories of trying to apply that equation). I don’t think that equation works, though, when you don’t know the weight of a cart, the strength of a horse, or the conditions of the roads. So I had to set some parameters. I needed the cart (wagon, really) to be able to carry two men and two women, along with two or three barrels or bags of miscellaneous supplies. I needed the journey to take less than a day. 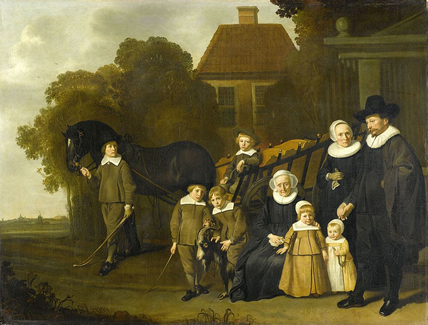 The wagon had to be decent, but more serviceable and sturdy, than luxurious. It had to be capable of traversing 50 or so miles of the muddy, unpaved London Road. Similarly, the horses had to be from a hearty stock, and affordable for hire by a journeyman. Not being an equestrian, a farrier, or a blacksmith (okay, let’s face it, I’m not even sure if I’ve ever even been on a horse), this has been a truly puzzling question. Doing a little digging into the Early English Books Online and a few other primary sources, I first learned what kinds of wagons would have been available to a London tradesman in 1666. Here, I relied mainly on woodcuts to show me pictures of how tradesmen conveyed goods. Hackney carriages were available for hire, but those would not likely have been owned by a tradesman. Coaches (Berlins) were just coming into fashion, out of Germany, but again my tradesman would not have found such a vehicle suitable to his needs or budget. Unfortunately, throughout Markham’s lengthy 200+ pages of advice to the horse-challenged, I could only find one bit of useful information for my purposes. He says: “In journeying, ride moderately the first hour or two, but after according to your occasions. Water before you come to your Inn, if you can possibly; but if you cannot, then give warm water in the Inn, after the Horse hath fed, and is full cooled within, and outwardly dried.” He then went on to say something about applying copious amounts of “dog’s grease” to the horse’s limbs and sinews, but I think I wandered off the page at that point. Then, I needed to find out how fast two horses can even pull a wagon. Throwing my question to the whims of Google yielded an oft-repeated response: a team can travel 4 miles an hour on paved or semi-paved roads. Horses can only travel a few hours at a time; so it looks like my fictional travelers would have to exchange horses several times at various coaching houses along the way. All of this also presumed a “perfect journey.” The reality is, travelers in the seventeenth-century England would also have had to contend with obstructions like felled trees; stalled carts and wagons, slow-moving travelers on foot; sheep, goats, geese and other animals crossing the road; and of course the occasional highwayman seeking to relieve them of their goods and personal belongings. Still, even without external challenges and delays, all my calculations suggested that it would take my travelers 15 hours to travel from London to Oxford, which was FAR TOO LONG for the purposes of my story. Yet, I’ve always been extremely scrupulous in my attention to historical details. So my puzzle has resulted in another conundrum—bend the facts to fit my story, or bend my story to fit the facts? By thinking through these kinds of obstacles and challenges (well, maybe leaving out the serpents and two-headed dogs), I definitely found it easier in my later books to think through the factors that might impact travel times. For example, in my third book, I have a coach-chase of sorts and one of the main things I had to work out was how long it would take for one cart to overcome the other. In fact, given that the coaches had the same number of horses and passengers in each, the only way that could work was having the lead coach stop over at a conveniently-placed coaching inn. Ultimately, I think it’s important to think of these conundrums not as tedious research questions, but rather as intriguing puzzles to ponder. I find it very satisfying to develop a plausible solution that integrates both creativity and accurate information. Sometimes as writers we may feel we’ve written ourselves into a corner—and if that’s the case, well then that’s a locked room mystery, right? Do I know how fast my horses were travelling? No. But I can give it a good guess. Susanna Calkins became fascinated with 17th century England while pursuing her doctorate in British history. A former pirate, she once served on the Golden Hinde–a museum replica of Sir Frances Drake’s ship–now dry docked in the Thames. Originally from Philadelphia, Calkins now lives outside of Chicago with her husband and two sons. 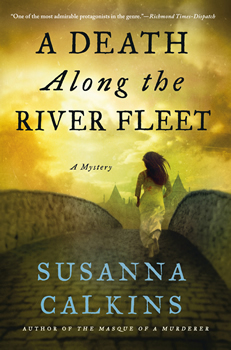 The fourth book in her Lucy Campion series, A DEATH ALONG THE RIVER FLEET, was nominated for the 2016 Simon & Schuster Mary Higgins Clark Award. 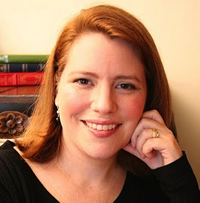 To learn more about Susanna, please visit her website.